U.S. prohibitionist drug policies have failed and a new global discussion around drugs is needed, say the caravan of human rights workers. Hundreds of people gathered in Mexico City’s central square Sunday to welcome the Caravan of Peace, Life and Justice, a group whose main goal is to end the war on drugs. The group took off from the Honduran capital of Tegucigalpa on March 28 and intend to arrive in New York City by April 18 when the United Nations will hold a special general assembly on the world drug problem. The caravan has already travelled through Honduras, El Salvador, Guatemala and much of Mexico, countries that now have some of the highest murder and violence rates in the world, which are largely due to failed policies in those regions meant to attack drug trafficking. Along its route to New York, one of the caravan’s objectives is to recover testimonies from people who have been affected by violence generated from the drug war and present this to the heads of state at the U.N. assembly, which will take place from April 19-21. One of the caravan’s main goals is “not only to point out the failure of the war on drugs, but also to denounce the violence, which increases the need to migrate to the US, and the dangers on the road for those forced to leave their countries,” said Ted Lewis, general coordinator of the caravan and director of Global Exchange, to the press upon their departure in March. “The prohibitionist strategy against this problem will not solve anything, with such a massive consumer market in the U.S. that need tons of illegal drugs and is creating an unsustainable situation in the U.S.,” said Lewis. The attempt to control consumption has also been used as a pretext to assert military control in Latin America and has led to the overpopulation of prisons, where “more than 2.2 million people are trapped in the prison industry, where nearly half are imprisoned for pure drug possession,” added Lewis. The Caravan of Peace, Life and Justice seeks to encourage a new conversation around drug policies and new approaches to the issue, and not to politicize the fight against drugs for partisan purposes, they say. 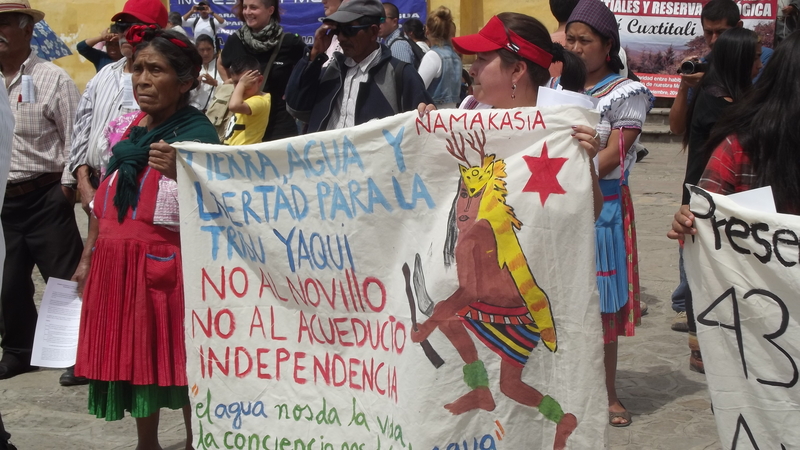 On 12 May the National Caravan for the Defence of Water, Land, Work, and Life arrived in San Cristóbal de las Casas Chiapas, having been organized by the Yaqui people of Sonora, Mexico. Via three different routes (northern, north-western, and southern), Yaqui have been touring the country to raise awareness about their struggle against megaprojects. 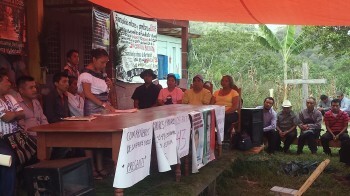 About 50 members of the Southern Caravan marched in San Cristóbal de las Casas, together with constituent members of other social processes in favour of the right to water, neighbours from Cuxtitali, defenders of wetlands, and female members of the Movement in Defence of Land and Territory, which struggles for the participation of women and their recognition within decision-making processes, among other goals. It should be stressed that the indigenous Yaqui people, who have for 3 centuries striven to defend their autonomy, territory, and right to water, have two of its members politically imprisoned: Mario Luna and Fernando Jiménez, both of whom are charged with kidnapping and robbery during the protests against the Independence Aqueduct, which transfers water from the Yaqui River to Hermosillo. This outcome was based on the violation of the indigenous peoples’ right to prior consultation. The three routes of the caravan will continue their paths toward the Mexican capital, where they plan to arrive on 22 May in a joint concluding action.